Location: Harris, Western Isles, Scotland. Ownership / Access: Amhuinnsuidhe Castle Estate. Notes: Amhuinnsuidhe Castle is a large private country house on the Isle of Harris, one of the Western Isles of Scotland. The house was built in 1865 for the 7th Earl of Dunmore, the then owner of the island. 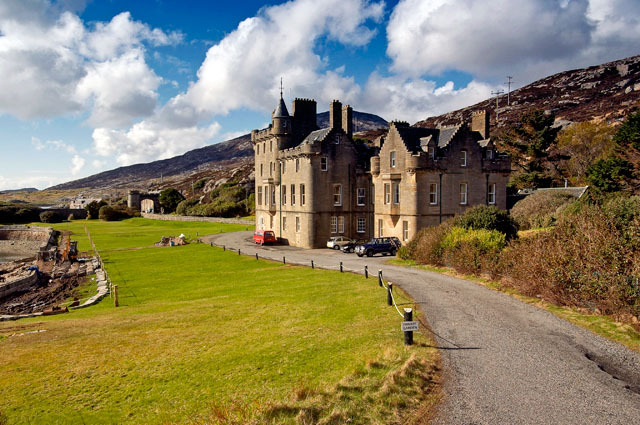 Amhuinnsuidhe was designed in the Scottish baronial style by architect David Bryce. In 2003 Amhuinnsuidhe Castle Estate purchased the castle and the fishing rights. The castle is now operated as a venue for shooting parties and other events.